Contact the closest Colorado Parks and Wildlife office for more details. As of 7/24/2018 Trout-Very Good-Action report all over the reservoir, High counts of fish under 16 inches with several larger than 20 inches reported being caught near Witcher's Cove, Rocking Chair and Stoll Mountain. PowerBait and Kastmasters producing nice results. Salmon-Slow-Try main channel 30'-35' near Deer and Duck Island. Trolling with Cowbells, Needle Fish or Dodger Squid. Northern Pike Fair- Underwater vegetation along south shore. Switch up your colors often to get the most action. Aquatic Nuisance Species Inspection hours for the month of May are 6:00 am-10:00 pm daily. As of 7/21/2018 water temperatures are in the mid 70's fishing has been slow for trout. The crappie and white bass seem to have transitioned a bit deeper and are being caught in the main lake. Bass fishing is fair, jerk baits and spinner baits have been working. Reminder -No fishing from marina slips or docks (next to is okay but can't use them in any way. As of 7/24/2018 activity has picked up the past couple weeks. Walleye are regularly being caught throughout the lake and from shore. Reports of smaller fish being caught have increased, so have a tape measure ready to make sure it's legal! Wiper action has also increased significantly, with several being caught from shore around the ramp. Worms fished low and slow seem to be doing the trick! As of 7/21/2018 lake level is dropping every day approximately an inch a day. Surface water temperature is approximately 79 degrees. We are open to boating. Fishing has been fair to good for crappie, wiper and walleye. As of 7/25/2018 not much has changed on the tailwater in the last few weeks. The river below the dam is running a lot lower than in past years. The flows have been between 250 and 700 cfs. Caddis, midges, and a few blue wing olives have been making up the hatches recently. Streamers and spinners can also be effective. The river is tinted green right now with about 18 inches of clarity. This bodes well, as anglers can use heavier tippet/line during this time as the fish are not as leader shy during the higher flows. As of 7/25/2018 Surface temperature is 76 degrees. Fishing reports have been fair for bass. Anglers are reporting fair success using soft plastics. Walleye are being caught trolling using bottom bouncers and vertical jigging techniques over the top of structure. Fish are deeper at this time of year, as the water warms up, so anglers should focus on fishing deeper during the day and early and late in the day as well. Boaters are reminded that the boat ramps open at 5 AM and close at 11 PM daily. As of 7/24/2018 the surface temperature on Martin Lake is around 72 degrees. Visitors have been fishing from shore and on boats. With warming weather, Martin Lake has seen increased boat traffic on the weekends. Trout are not as active and will move to deeper water during the heat of the day. However, fishermen still have success using PowerBait and similar products. One visitor reported catching a 14 inch trout near the Martin inlet. Warm water fish, like bass and sunfish are active in the mornings and may be found guarding spawning beds near the shore this time of year. Several northern pike have been reported. Visitors are using a variety of bait to catch pike including stick bait lures, such as Rapala lures. The surface temperature of Horseshoe Lake is about 69 degrees. Visitors are having some success fishing from the dam for smallmouth. The smallmouth bass start to move around in the morning as the water heats up and have been seen feeding from the surface. Small rubber spider or other top water bait could produce exciting catches during those times. This 762-acre impoundment is located off of E. Quincy Avenue, two miles east of E-470. As of 7/24/2018 Water temp is 68 degrees. Trout fishing from shore is slow. Occasionally we have received a good report using PowerBait off the dam. The dam can be one of the better areas for trout from shore this time of the year due to the deeper water. Boaters also reporting slow to fair conditions on trout trolling with crawlers and lures. Walleye action from boats is slow to fair trolling with bottom bouncers and jigs tipped with crawlers. Some reports of Yellow Perch being caught from boats and shore using jigs tipped with worms. Restricted to electric motors only. For more information call 303-326-8425. Park hours July 5:00am-9:30pm. This 881-acre impoundment is located in Cherry Creek State Park, in Aurora. There are two entrances to the park, the east entrance off S. Dayton St. and the west entrance off S. Parker Rd. As of 7/25/2018 the trout have been tougher to catch but some success has been reported using nightcrawlers along the bottom. Walleye fishing is slower but fish can be caught during the cooler parts of the day either trolling crankbaits or using a jig tipped with a leech or nightcrawler. Reports of a few crappie being caught in some of the deeper sections of the lake. As of 7/24/2018 Water temp is 69 degrees. The water level is good. Bass fishing is rated as slow to fair using jigs, chatter baits and sinkos in 10-15' of water. Some reports of top water lures working just outside the weed line. Trout fishing is slow, a few reports using spinners and flies. Park Hours for July 5:00am-9:30pm. Restricted to artificial flies and lures only. Electric motors only and hand launched watercraft only-trailers and vehicles prohibited in the water. For more information call 303-326-8424. This 1,356 impoundment is located in Chatfield State Park, as of 7/26/2018 water temperature is 73. Trout fishing has slowed with the warmer water temperatures. But are still being caught at various locations around the lake. Fishing for smallmouth has been fair during the low light periods of the day using top water baits. Walleye fishing is slowing as well with the warm water temperatures. Most of the fish are being caught in the slightly deeper water. Please note that due to the Chatfield Reallocation construction fishing access from the west side of the park (Eagle Cove - Kingfisher) is closed. Please access the lake from the east side of the reservoir. As of 7/21/2018 Perch fishing has been good using various baits throughout the lake. Walleye fishing has been good if you can find the fish on structure throughout the lake. Trout fishing has been fair to good with the recent stockings. Special fishing regulations at Rifle Gap Reservoir include a bag and possession limit of 1 walleye 18 inches or greater; bag and possession limit for yellow perch is 20. As of 7/25/2018, Fishing is excellent with anglers reporting PowerBait and small silver or gold spinners the most successful baits to use. Early Settlers boat ramp is CLOSED for the season. Oak Point and the Island boat ramps remain open at this time. The lake level is receding rapidly. Don't forget to stop at the entrance and have your boat inspected prior to launching. The ANS inspection station is open from 6:00am to 8:30pm 7 days a week. As of 7/20/2018 the lake is starting to experience some algae blooms which can make the fishing tougher with decreased water clarity. Some pike have been caught on various baits along the edges of the weed beds. Trout fishing has been good with many smaller fish being caught using PowerBait or nightcrawlers. The occasional larger fish has been caught. Water temperatures are continuing to rise and could negatively affect the fishing. This 8,900 acre reservoir is located west of Gunnison. As of 7/22/2018, water levels are much lower compared to last year and concentrating the fish. Kokanee Salmon fishing has been fair at various depths trolling. Jigging is starting to become the go to technique as the kokanee begin to school up before moving up the Gunnison River. Smaller lake trout are being caught at the deeper depths of the water column. Perch fishing has also been good along the rocky sections of shoreline. Anglers can check on current conditions and boat ramp inspection schedules by contacting Curecanti National Recreation Area at (970-641-2337). 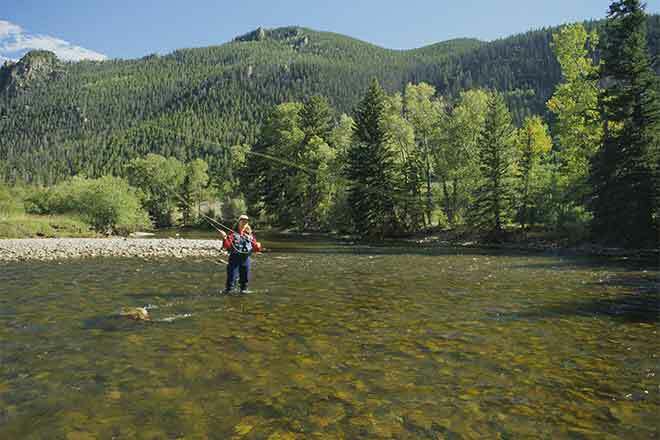 As of 7/22/2018 Mancos is a great place for consistent action from trout and yellow perch. Most of the trout action is from 10-12 inch fish, but there's very good opportunity at an 18-20 inch trout and a few 12 inch-plus perch. Great opportunity for kids to catch fish. Most anglers are finding success with bait (PowerBait, eggs, and crawlers) fishing just off bottom or under a slip bobber. For a chance at the yellow perch and trout, a small jig fished under a bobber on a long leader and tipped with a piece of worm is a good bet. Casting or trolling typical in-line spinners (Panther Martins, Mepps) from boats is another approach at the trout. Hand-launchable boats (non-motorized kayaks, canoes, belly boats, etc) are a great way to fish the lake in this off-season. This is the first year in more than 15 years that the lake has not gotten decent ice to fish. As of 7/22/2018 water temperatures are in the mid 60's fishing has increased some for trout with recent stockings, baits fished off the bottom in 20 feet of water. Lake trout have been tough but the deeper portions of the reservoir is where those fish can be caught using nightcrawlers off the bottom. Pike have been caught anywhere in the reservoir that has good weed growth. Many of the pike caught have been small in size.